Ipswich Town were cheered on by their most famous fan for their game against Bristol City - but not even Ed Sheeran could inspire them to a first win under new manager Paul Lambert. The singer was at Portman Road with his fiancée Cherry Seaborn on Wednesday evening. He posted a picture on Instagram, along with the caption: 'Tractor boi & gal'. However, it was far from the 'Perfect' night for them, as Town's wretched season continued. Ipswich twice took the lead through a brace from the in-form Freddie Sears, but ended up losing 3-2. 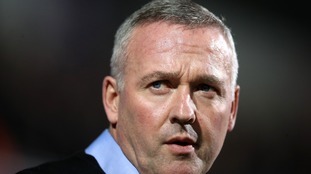 The result means Town haven't won any of Lambert's four games in charge so far and remain six points adrift of safety at the bottom of The Championship.